(I missed it by a day.) It was on April 19, 1924, a Saturday, that the National Barn Dance began it’s 36-year run on radio station WLS in Chicago. In fact, the Barn Dance had more than a run. It dominated. It was model for all the live country music radio jamborees that followed, close to 500 in all. It’s most eager competitor, the Grand Ol’ Opry, copied the National Barn Dance from the start and lagged behind it for twenty years. Through the 1930s and into the war years of the 40s, there was no country music radio show, and few from any other category, that had as large and popular a cast or as strong a cultural presence as the National Barn Dance. During the Depression, a poll of listeners identified Lulu Belle & Scotty, the Prairie Ramblers (with Patsy Montana) and the Arkansas Woodchopper as their favorite members of the Hayloft Gang. All three acts stayed at WLS for the better part of three decades. The Barn Dance itself was more than a single broadcast. It was a brand that encompassed about 5 hours of Saturday night radio shows, 2 two-hour long live theatre shows, 2 print publications plus regular coverage in its parent company’s magazine (The Prairie Farmer), and an extensive artists bureau that maintained regional road shows and regular personal appearances by its many Saturday night stars. But my interest in the National Barn Dance was piqued during the first big field recording session for my 1979 grant from the Indiana Arts Council (see the Indiana Hoedown section in drdosido.net). Fiddler Francis Geels of Decatur, Indiana listened to the show every Saturday night as a kid, and had learned several pieces from the broadcasts, most notably from the playing of Slim Miller of the Cumberland Ridge Runners. Give a listen to Mr. Geels playing this fine, rare old tune: Get Aboard the Ship. Then fast forward twenty years to my historical research on traditional fiddling in the Old Northwest. I started poking around to find more about the early days of the National Barn Dance. I had long known of George Biggar‘s account of the first broadcast on April 19, 1924: “Tommy Dandurand, if I’m not mistaken, was in charge of the first little fiddling band. The announcer thought a square dance caller might be of help, so a call was put on the air. Tom Owen telephoned that he ‘used to call dances in Missouri.’ So down he came.” Biggar, however, had not yet started his long tenure as a WLS program director. His account is not first-hand. What I found in the Chicago newspapers of the day is that “Timothy Cornrow from Ioway” was the first fiddler. In succeeding weeks, the fiddlers who played on the Saturday night variety show were described as generic “barn dance fiddlers.” When summer came, WLS held an on air-contest for old-time “fiddle teams” that was won by George Adamson of Kenosha, Wisconsin. Frank Hart of Aurora, Illinois and William McCormick of Marseilles also placed. A picture of these two, plus guitarist J.B. Priest, became an icon for the early National Barn Dance. My conjecture is that that either Mr. Hart or Mr. McCormick was the fiddler heard on 1926 recordings of Tom Owens WLS Barn Dance Trio (listen to Hell on the Wabash). Tommy Dandurand, a retired streetcar operator from Kankakee, joined the National Barn Dance in the fall of 1924, and led the show’s house band of fiddlers until at least 1930. Along with fiddler Rube Tronson and square dance caller Ed Goodreau, Tommy Dandurand & His Barn Dance Fiddlers recorded 14 sides for Gennett in 1927 (listen to McLeod’s Reel). In the early 30s, Mr. Dandurand’s younger partner took over as leader of the Texas Cowboys (the National Barn Dance Orchestra of the 1933 Bluebird sessions?). By the middle of the decade, the house band had given way to showier string bands like the Cumberland Ridge Runners, the Prairie Ramblers and the Westerners. It was the 1930s when young Francis Geels and his siblings began to learn tunes, songs and stagecraft by listening to the Hayloft Gang’s Saturday night broadcasts, and by attending WLS-sponsored Home Talent Shows and other personal appearances by Barn Dance stars. 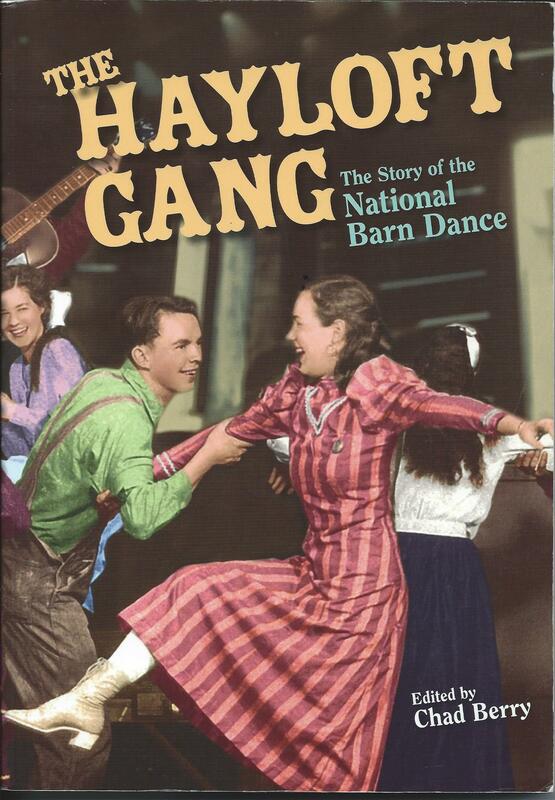 Many years later, I began to consult with filmmaker Stephen Parry of Chicago, as he began work on The Hayloft Gang: The Story of the National Barn Dance for Hayloft Gang Productions and Independent Television Services. 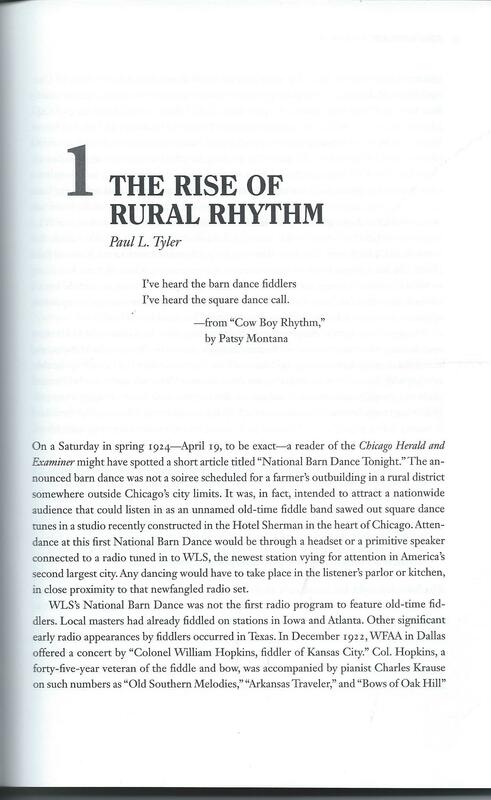 My contributions to the documentary included serving as music supervisor and as author the lead essay, “The Rise of Rural Rhythm,” for the companion book published by the University of Illinois Press. Perhaps my biggest contribution to the project was to introduce Stephen Parry, the director, to Francis Geels and his sisters, Helen Loshe and Esther Mowrey. A movie crew traveled from Chicago to Decatur, Indiana and interviewed the 3 siblings on the old family farm. Several heart-warming clips are included in the documentary. 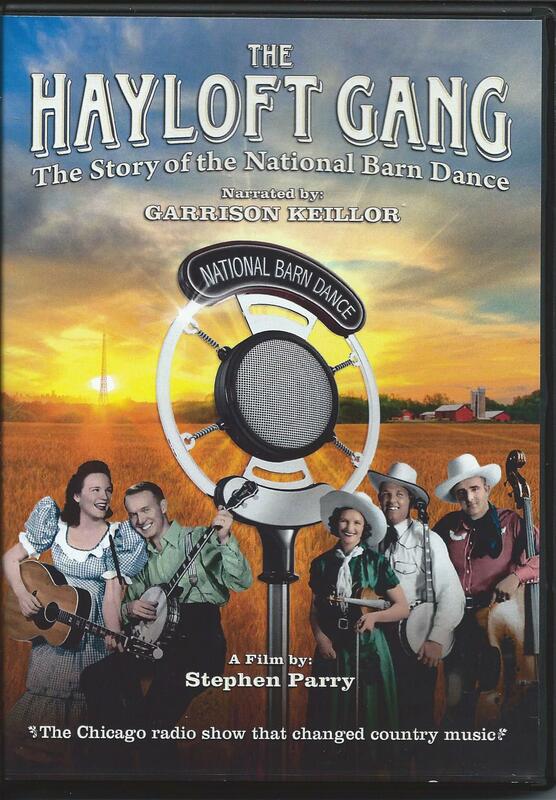 And the home DVD version of The Hayloft Gang, which showed up in my mailbox 90 years to the day after the National Barn Dance’s debut, includes a last performance by the Geels Family Band under the Extras menu.